<< Back to What's New? Intelligent Steel Fabrication encompasses more than just the ability to simulate jobs and then viewing the process in real time. The comprehensive software solution manages the entire fabrication shop. Starting with purchasing/stock control, nesting, routing, CNC program generation and last, but not least, seamless processing through the system without direct operator involvement. 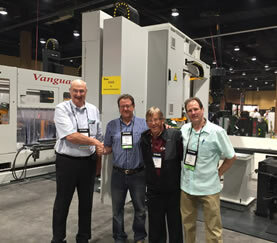 Tom Boyer, President of Ficep Corporation congratulates Steve Fisher Jr., Steve Fisher Sr. and Kurt Fisher all of Steel Fab Enterprises of Lancaster, Pennsylvania on their purchase of the Ficep 1103 DDVB drill/saw system that was exhibited at the NASCC. 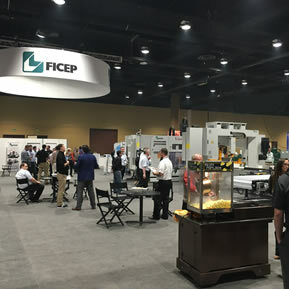 The drill/saw exhibit also included automation to remove trim cuts, small parts and drops to an automated conveyor system without operator intervention.